Please allow me to interrupt the late and sporadic posts surrounding our wedding for a big, giant life change. As always, when it rains it pours and we found out just a few weeks prior to our big day that Bryce was offered a promotion through his job to Seattle, Washington. 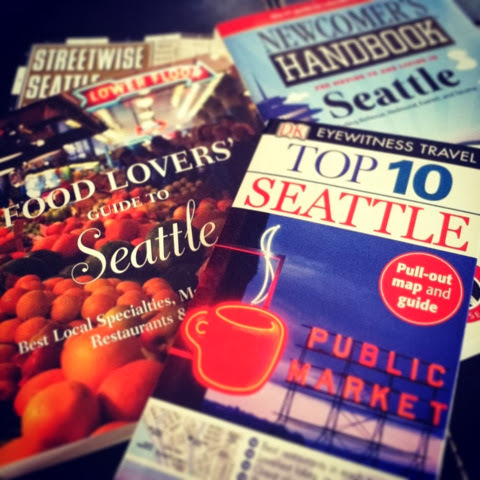 We stocked up on maps and books, including the Food Lovers Guide to Seattle and I got right down to reading them immediately! Just last week we went to the Emerald City for a visit, primarily to scope out apartment rentals, although exploring Seattle's food scene was #1 on my list! After landing at an unnerving hour on Saturday morning, Bryce and I quickly got to fun-having and food tasting on a Savor Seattle food tour of the ever famous Pike Place Market. 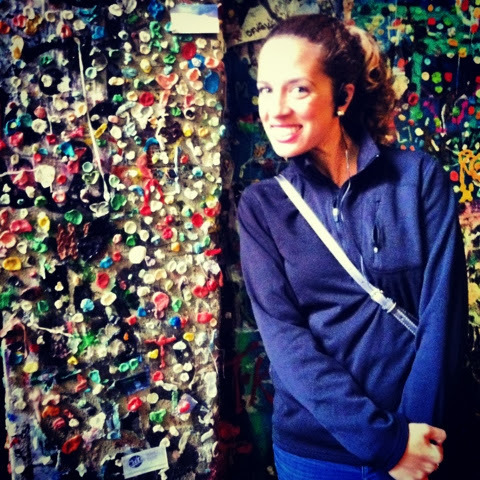 The first stop was the well known and stinky gum wall, although we didn't opt for any samples. The tour was incredible and deserves a whole post of it's own, stay tuned! UPDATE: Here's the post of the whole tour. Not long after our first activity was finished we rearranged our schedule to be sure that raincoat purchasing was next. We explored the largest Macy's I've ever seen while Bryce embraced his touristy ways! 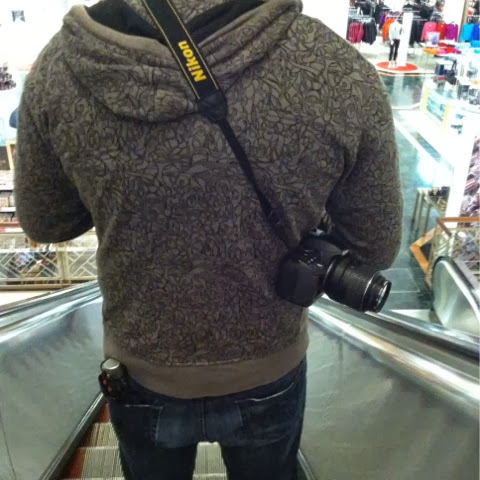 Camera strapped to ones-self - check. Umbrella in pocket - check. Now you know how much I love a good Farmer's Market, don't you? The Pike Place Market is basically the best, largest, smartest, friendliest market ever. We explored the market at leisure after our tour was finished. Although we weren't hungry in the least we were thoroughly entertained by the many, many options and affordable prices, especially when compared to the absurdity that is pricing in Hawaii. 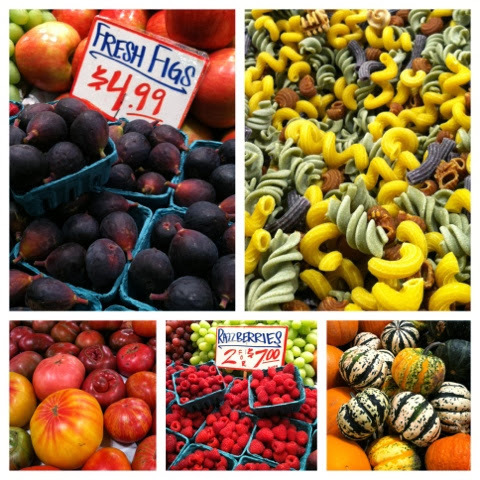 $4.99 figs, multi-colored pastas, heirloom tomatoes, razzberries, adorable little pumpkins - yes, yes, yes, yes, yes! The following day we explored Ballard, the town just North of Seattle in which we'll be living for the next year. Their weekly Farmer's Market takes over several blocks of a road right in the heart of the town every Sunday. Don't get me wrong, I do love our Farmer's Market in Hawaii, although there are only so many things that grow in an island climate that's pretty much the same all year long. Needless to say the markets on the mainland have much more to offer. 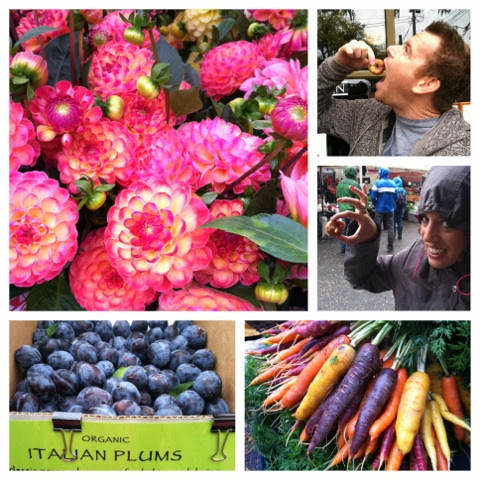 Every type of flower you've ever seen, tiny little freshly made doughnuts, Italian plum/prunes which we ate a dozen of, and a rainbow of whimsical, story book worthy carrots were just a few of the highlights of the Ballard Farmer's Market. Also note that lovely rain coat that I scored! Nothing says "Welcome to Seattle" better. 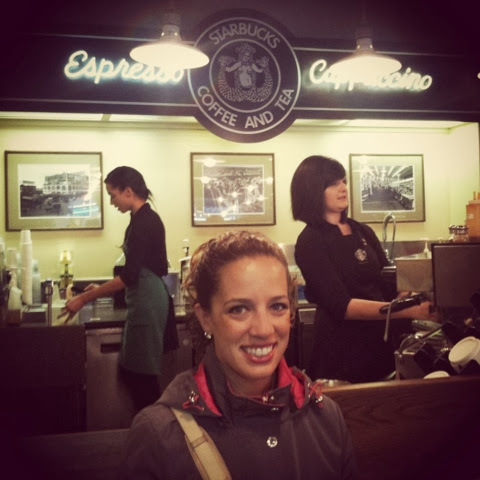 Certainly the trip wouldn't be complete without a stop at the flagship Starbucks store! We spent the first two nights in a hotel in downtown Seattle, within walking distance of Pike Place Market and the original Starbucks locations before moving to a vacation rental in Ballard to be sure we liked the neighborhood. If I hadn't already been sure that I could love a place that sells freshly made doughnuts at a Farmer's Market, a visit to the Trader Joe's sealed my fate! We truly enjoyed our mini-vacay and pseudo-honeymoon in Seattle and Ballard is surely the spot for us. We'll take a true honeymoon next year to Italy and Ireland, thankfully we didn't plan it to follow the wedding immediately because we'd be losing out on our last precious weeks in Hawaii. Your next purchase at Trader Joe's has to be fig butter. My mom just bought me a jar and I spread it on a water cracker with some brie. It's amazing! P.S. Trader Joe's Way More Chocolate Chip Cookies - get on it, girl! Brookie - Say no more, those are the magic words: fig and brie. I'd eat it on a piece of cardboard... but probably won't! Do you have a TJ's nearby? Katy - Thanks! I'll add those to the list, too. Our new apartment is 0.5 miles away from the store :) That's exercise enough for a small box of cookies, right? Yes, we've got one about 20 minutes from our house and there is one across the street from my mom's work in Boston. You can also buy mochi there in the frozen food section! Awesome! 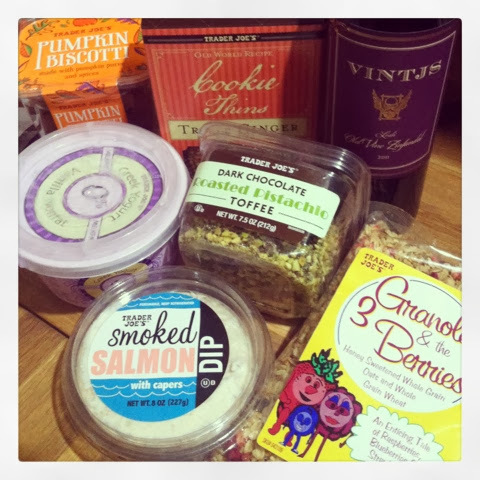 Have you ladies seen the What's Good at Trader Joe's blog? It blows my mind. Sooo exciting! It's my dream to visit Seattle.. of all places to be promoted too... wish you the best of luck on your new adventure... and totally want to take that tour! Jamie - do it! We can have a blog mashup!